Loving Jesus, drawing and sculpting, staring at my roaches and playing with my crabs. 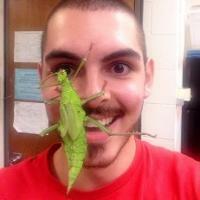 I'm an Animal Ecology major and working in outreach and illustration with ISU's Entomology department. They're stunners! I also had no idea they lived in AL. How's the sac? I don't even want to think about what I would need do in this situation. Are they a "wild" species in your area? This female is now five days after her final molt. She came from the Insect Zoo's colony of around a thousand hissers, some of which have one Giant Morph male in their lineage. I've isolated her with a subadult male and subadult female who show similar coloration. That'll be much better. If you really want to see them go crazy, just put in a fruit they haven't had in a while. Sometimes, though, I see individual roaches with stringy or extra-moist frass. Chronic issues with it are usually indicative of a husbandry problem, I've seen it when the habitat is kept too wet before. Isolated cases of it just seem to happen, though, and do not seem to pose a threat to their health. I bet it's uncomfortable, though! Mr. Crackerpants, that's an interesting read! A bit of corroboration for something I've been telling people I think is true. Ha, how did I miss that Smaller Majority article? Thanks for sharing, Keith! At the Insect Zoo we have: Lucihormetica subcincta Lucihormetica verrucosa Archimandrita tesselata Rhyparobia maderae Gyna lurida Therea petiveriana Therea olegrandjeani Byrsotria fumigata Periplaneta americana as-yet-unidentified Periplaneta Nauphoeta cinerea Pycnoscelus surinamensis Panchlora nivea Blaberus giganteus Blaberus craniifer Blaberus discoidalis Blaberus fusca Blaptica dubia Eublaberus posticus Princisia vanwaerebecki Gromphadorhina portentosa and have had Elliptorhina laevigata and E. javanica. I have to say I'm floored at the growth our hobby has seen over the last few years, in members and in species. Love seeing all the off-the-wall stuff you end up raising! And yeah, Z. longipes are pretty, but these are insane. The fourth instar is like blown glass. That's really interesting that they didn't burrow on that substrate. I would've thought they'd try and make do with it. Picky little guys. Might be worth putting them on a variety of subs to see what they'll burrow in and what they won't? Potting soil, plain coco fiber, sand mixed with something else, fine gravel... Just for knowledge's sake. Always fun to see what new tiny species you're working on! These sure look fast, and have really impressive leg spines... Do you know the purpose of the curved ooth? Many premature captive deaths are the result of horsehair worms. The Insect Zoo has yet to get a JC which hasn't had a worm... there's no way to tell until a day or two before the stupid thing emerges. Good story, Cariblatta! I'm sure he enjoyed living with so much potential food! Saw these on Kyle's site, very probably going to have to grab some sometime. I mean, I've had Ceuthophilus before and they were fun... but at around twice the size they should be much better! How many do you have? This is seriously interesting; and well-documented too! Just wanted to say that they look great (as if a roach could ever look bad)!